Parking is available at the restaurant. Visit our website or Facebook Page for upcoming special events! Please call our Business Development Manager, Kristen Cavanagh, for catering inquiries. Our wine cellar private dining room is a beautiful stone room constructed with local stone from Milverton, Ontario. The room seats a maximum of 24 guests (we do have options for larger groups, see below). Special prix-fixe menus are available and can be tailored to your group's preferences and needs. Room contains a large flatscreen TV for presentations with HDMI hook up and mac adaptor. Our Tom Thompson Dining Room is also available to book out for private functions and features a brand new 16:9 100" HD Projector screen with full AV capabilities for special meetings or events. Room seats a max of 70-80 people. Please contact the restaurant for more details! 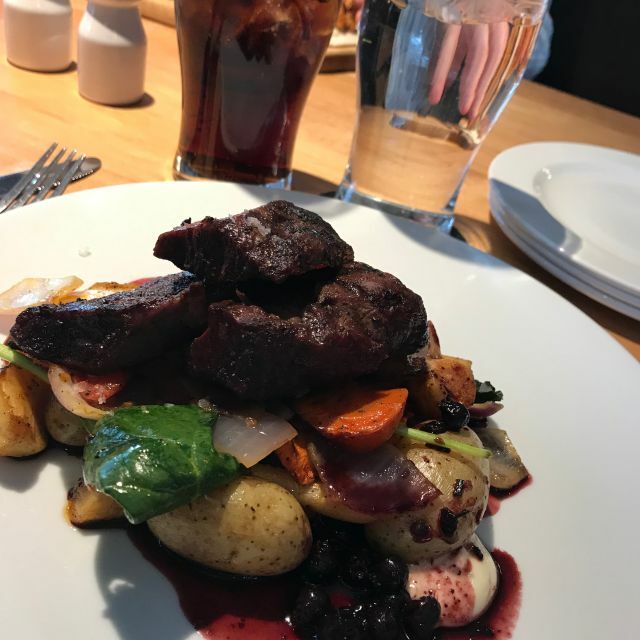 Borealis Grille & Bar is a restaurant that serves the very best of locally crafted foods and beverages at everyday prices. We bring "The Taste of Ontario”, the highest quality of fresh products from Ontario farmers, breweries and wineries to our guests each and every day. Combined with a deep respect for local heritage and craftsmanship and an unwavering dedication for sustainability and the environment, Borealis represents the embodiment of our philosophy and values. Featuring a la carte Brunch items for the person that provided the best advice, and wiped away the odd tear. Join us for Brunch from 10AM to 2:30PM on Mother's Day. This was a very quiet dining experience - complete with savoury entrees and friendly service. Will be going back again! Great burgers, service, and atmosphere. Will come back! I have always had great experience as Borealis in the past. Unfortunately the service was lacking, one dish did not arrive, our son didn’t get his ice cream and we were ignored towards the end of our meal. I think we waited 20 min just to ask for take out boxes. The food was great, as it usually is. I’m going to say it was likely just a bad day for the service but I’m not going to lie, I was disappointed. Great service, food was delicious, and no more expensive than any other mid range to nice restaurant despite the amazing attention taken to local, and environmentally sustainability. Overall wonderful restaurant, would definitely eat there again. We were the only ones sitting in the dining room so it was quiet and it worked out well because we were reviewing a recent trip and it was nice to be able to hear each other. Food was tasty, visually appealing, and served at the appropriate temperatures. Linguine was excellent and the salad and veggie burger with regular burger toppings was also very good according to my guest. Fruit cobbler with ice cream was shared and added a nice finish to the meal. We both had the ginger, mint and cucumber drinks. Excellent! Highly recommended. Nice to know: Has a private dining room for it looked to be about 20 guests. Borealis is always a great experience when we go. The Butternut Squash Salad with Cajun Tofu - awesome. Fish Lettuce Wraps - Fantastic and the guys had burgers which were also great! We had a family gathering to celebrated three generations of birthdays at Borealis on Sunday. The staff were awsome and accommodating . The food was awsome and we had a great time. I appreciated that the restaurant allowed us to bring our own cake and served it up for the 4 birthday guests we were honouring. Thanks to Kylie and Megan for helping to make this a memorable occasion. Very reasonable prices and great atmosphere. Was pleasantly surprised in the earth hour participation and enjoyed a nice candle lit meal. Our server Amanda was fantastic - it was our 6 month wedding anniversary and she made us feel like it was our 50th. Her excitement and passion was infectious, and she was so personable! Borealis is lucky to have an outstanding server like her! The food was great, and the atmosphere was nice, but by far our favourite part of the evening was our amazing experience! Great food, great menu choices and great ambience. The service was outstanding. Large glasses of water with cucumber were brought to our table soon after we sat down. Our drinks order was taken and brought promptly. My daughter did not like her mixed drink and exchanged it at no cost. All the meals were served promptly and were delicious. We had the sampler dessert tray and the 4 items were very tasty. We never felt rushed but rather we felt appreciated. The bill was reasonable. We shall return. Delicious food, love the creative and locally sourced options. Our table location was drafty, but that’s winter in Canada! This was a fantastic restaurant with a varied menu offering interesting selections. They were also extremely accommodating to our food sensitivities as well. A great choice that we will now make a regular stop when we are in Guelph visiting our son at University. We had a great time. The staff was very friendly, knowledgeable about food served and helpful in making decisions. At some point it became a little noisy as lots of people were waiting at the bar and talking loudly but it didn't last long. I'll definitely come back in the future. Another Return visit to Borealis, and another wonderful dinner and evening. The food, the service, everything was top notch. The only downside was that it was a very cold day in February, and there was what seemed like more than the usual cold air blowing through the restaurant, but nothing that would discourage another visit - just bring a sweater in case! I have never been hooked on a restaurant before but this restaurant has me hooked. The food is amazing with anything you try. Great service from our waitress Portia. Very friendly and always came back to check on us. More vegetarian options would be nice. The chickpea burger was okay, a bit greasy so you couldn’t get the flavours. Miles, our server, was outstanding! Everything was terrific. We have been many times and will continue to come back! There was a noisy child in the restaurant, but I know that is something you can't help. Thanks for the delicious food! We were celebrating our daughter’s birthday. Unfortunately parts of the food came out cold fore each of us. My torture was delicious but the potatoes were cold. This was the same for others who ordered bowl dishes. My husbands sausage bowl was cool and had to be sent back to be heated. One of our daughter’s ordered the cheddar burger which she enjoyed but it too was not heated. Unfortunately this made for a less that great meal we were expecting and because we had quite a wait for our entrees we didn’t want to complain because we felt it wasn’t worth a further wait. Our server was great and when we did mention it to her she did try to make up for it by discounting one of our entrees. Her service was great - she clearly couldn’t control what the kitchen put out. Won’t be rushing back. This is unfortunate as the menu is very appealing and the food was very tasty but cold! That date night meal was excellent and terrific value. Our server, Portia, was beyond brilliant. She was attentive, engaging and entertaining. We thoroughly enjoyed our evening. Great spot for a casual dinner. Great food and lots of drink selections. Priced a bit higher than average but you get what you pay for. Less noisy than last time which was nice. Appetizers too pricey, make them smaller and charge less. Bet you would sell more. We will be back. Service was excellent. Food and service were great. It was quite noisy... Tables are packed pretty close together. Ideally a place for coats is needed... The hooks on our booth were used by others and since tables were close, I'm sure they would end up being trod on. I was slightly disappointed by the Vanilla Cheesecake with seasonal compote. There was only one small dot of about 4 blueberries in the very centre...to me that's not really compote. But the cheesecake tasted great (I just hoped for more blueberries). But the overall experience was great and we'll definitely be back. Normally the food here is top-notch and everything is beyond my expectations, although this time the food wasn't the best I've had. It wasn't just-out-of-the-oven-hot but not cool by any means. The quality and taste wasn't what I expect from Borealis, but still much better than any chain restaurant you'll go to. I wanted to try something new but I guess I might be better sticking to what I know I like! All was good except for a couple minor things. Please contact me directly. Thanks! We enjoyed a special New Year Eve dinner. The food was delicious. The place was a little busy. We needed to wait about 20 min to get a table. Though, we've booked a table ahead of time and got our reservation confirmed for a specific time. Despite the wait time, the overall experience was very good. We would certainly come back here one day. Wonderful local spot. Have been several times now and will continue to return. Great service, excellent food and setting. didn't like your house salad dressing but other than that everything was great. Classy enough for date night, informal enough for families, Borealis offers a very good meal at a fair price. Our server, Flora, handled my food sensitivities kindly and knowledgeably, even offering an option I hadn't noticed. They participate in the Ocean Wise program for sustainably sourced seafood, and choose local produce and meat whenever possible. You can actually hear your companion speak, thanks to subdued background music, carpeting and other soft surfaces, and staff's careful avoidance of dish and cutlery clatter. By the time we left, the room was full, yet still a good place for conversation. Very pleased, and will definitely return. The meals and desserts are freshly made, sourced from local providers, and exceptionally delicious with both a unique and creative flare for introducing you to a higher experience of food flavours. The wait staff are very attentive and will actually cite prices of daily specials (unlike many restuarants that surprise you with an inflated bill). On the negative side, they welcome patrons to the point where wandering screaming children are let free to roam and disturb other patron tables, without keeping the offending parents in check to mind their kids. It's fine to be family friendly, but they have the right to reign in expectations that some may have -- thise who may feel entitled to use a restaurant as a daycare facility. We've come here fairly often, so this is not the norm on most occassions, but be wary if you're trying to book a table for a quiet romantic get-away. Otherwise, the food and service are wonderful. Try it and decide for yourself.